Thank you for visiting to our Home Page. pilgrims , is located nearby Mitake Shrine. Mt. 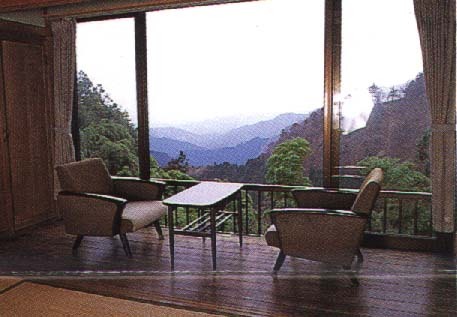 mitake has long been worshiped as a sacred mountain. in a Japanese setting and the beauty changing with the seaspns. We have 10 rooms without a private bath . 2 bath-rooms are for public use . But you can use them as private baths, after 8:00 p.m.to 9:p.m..
All guest-rooms are on mountain-side. You can enjoy a good view. To get Mt.Mitake (from JR Tokyo sta.) ,take JR Chuo and Ome Line , Tama bas and Cable car . (From JR Tokyo station) Take JR Chuo Line to Tachikawa Sta..
Change a train at Tachikawa to JR Ome Line bound for Okutama . Get off at Mitake staion. Take a bus to "Cable shita". There is cable car station ,named "Takimoto".Take a cable car to the top station named "Mitakesan". It takes 15 minutes to Komadori Sanso from "Mitakesaan"station. It takes about 3 hours from JR Tokyo station.